Methane levels as high as 2845 parts per billion (ppb) were recorded on April 25, 2015, as illustrated by the image below. This is an extremely high peak. The average daily peak in 2015 until May 1 was 2371 ppb, while the highest daily mean ranged from 1807 ppb (January 10) to 1829 ppb (April 22). Daily peaks and daily highest mean levels in 2015 are shown on the image below. These peaks are much higher than they were in previous years, as illustrated by the image below, from an earlier post and showing the average highest peak readings in 2013 and 2014 at selected altitudes.. Peak readings in above image are averages over April 2013 and April 2014. On specific days, peak readings could be much higher, e.g. 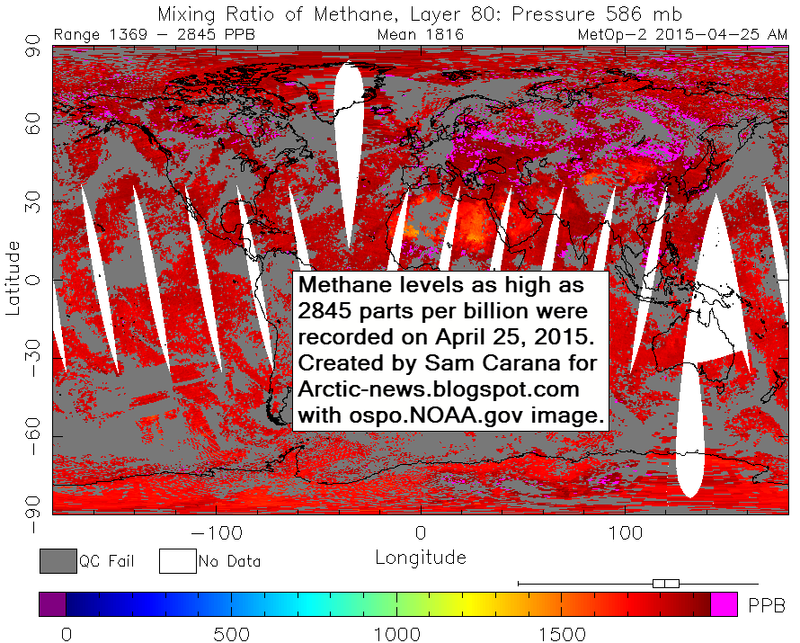 on April 28, 2014, methane levels were recorded as high as 2551 ppb at 469 mb. As said, methane levels as high as 2845 ppb were recorded on April 25, 2015, while the average peak for the first four months of 2015 was 2371 ppb, and this average was calculated from peaks across altitudes. Peak levels in April appear to be rising strongly each year, following higher peak readings during previous months, especially at higher altitudes, i.e. especially the Arctic Ocean. 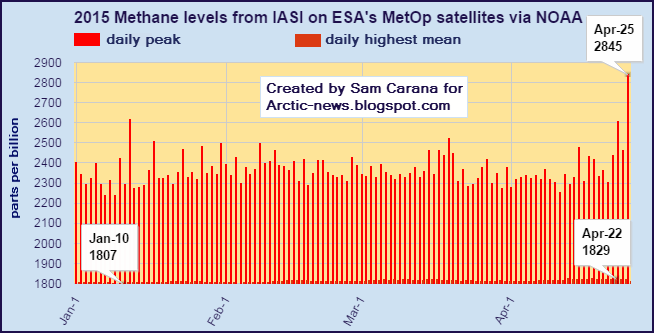 It appears that much of the additional methane originating from the higher latitudes of the Northern Hemisphere has moved closer to the equator over the past few months, and is now accumulating at higher altitudes over the continents on the Northern Hemisphere, i.e. Asia, Europe, North America and north Africa. 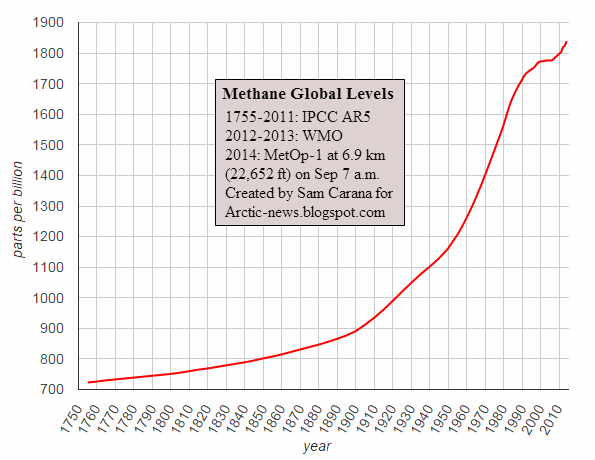 Further analysis of the rise in global mean methane levels appears to confirm the above. The image below shows methane levels on April 22, over three years. 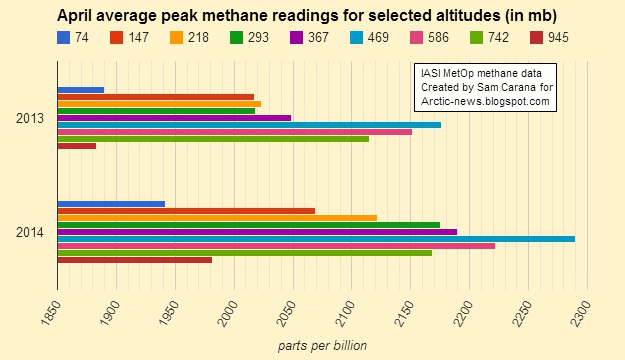 While there appears to be little or no rise in mean methane levels at low altitudes, the rise is quite profound at higher altitudes. Things look set to get worse. As shown by the image below, from an earlier post, global methane levels have risen sharply from a low of 723 ppb in 1755. Mean methane levels were as high as 1839 ppb in 2014. That's a rise of more than 254%. As that post concluded a year ago, it appears that the rise of methane in the atmosphere is accelerating. What can we expect? As temperatures can be expected to continue to rise and as feedbacks start to kick in, this may well constitute a non-linear trend. 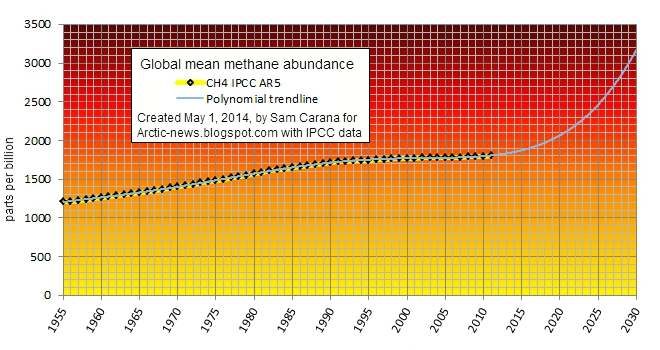 The image below shows a polynomial trend that is contained in IPCC AR5 data from 1955 to 2011, pointing at methane reaching mean global levels higher than 3000 ppb by the year 2030. If methane starts to erupt in large quantities from clathrates underneath the seafloor of the Arctic Ocean, this may well be where we are heading. And everyone that want to repost it on any social media. Next one will definitely be on Methane and most of the pics and graphs will come from here with your kind permission. So, I'm looking for that 10 years number, and hopefully more details, like 5, 19, 20, 50 years. I think that's about all I need, Most of the rest of the info and pictures will come from here. Thanks again for your support and make sure you have a nice day. See FAQ#13 and methane hydrates. Thank you very much Sam. Arctic-News is defenitely the best!